(Bloomberg) -- JPMorgan Chase & Co. and Goldman Sachs Group Inc. are among those expressing concerns about market liquidity. Investment research firm CrossBorder Capital Ltd. sees a more reassuring scenario. CrossBorder’s report comes after a stream of concerns expressed about the impact of falling liquidity. Goldman strategists have said it may be responsible for the dislocation between equity volatility and economic fundamentals, while JPMorgan’s Marko Kolanovic said a volatility-liquidity loop can create “violent” markets. 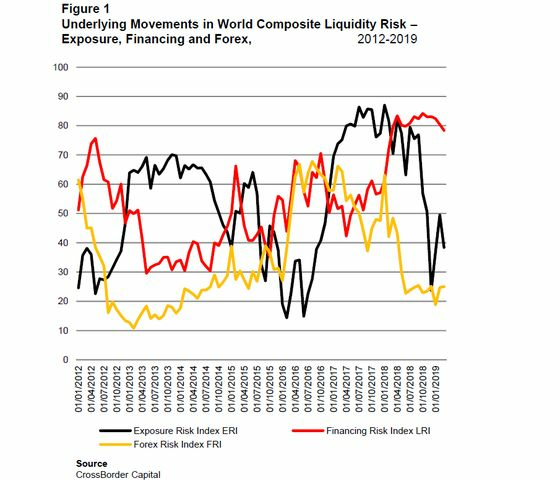 Morgan Stanley’s Andrew Sheets cited low liquidity as potentially exacerbating any sell-offs, in a recent interview. While financing risk still seems elevated, it appears to have peaked amid signs that some major central banks are about to re-start quantitative easing policies, the CrossBorder report said. The research firm favors a risk-on approach from investors, with the caveat that central banks must return to a “permanent state” of QE, it said. While the latter “is a big ask,” it is “dictated by the changed nature of the financial system,” according to CrossBorder. Investors should hedge high equity and corporate-bond exposure with securities with greater convexity, a measure of sensitivity to interest rate changes, according to the firm.